AgustaWestland, a Finmeccanica company, is pleased to announce that the first production AW189 8 tonne class twin engine helicopter performed its maiden flight at Vergiate plant (Italy) today. The aircraft is expected to be delivered to Bristow Helicopters Ltd. by year end to carry out offshore transport missions in the North Sea, with operational readiness planned in early 2014. Additional two AW189 helicopters are currently under assembly in Vergiate. The AW189 Type Board Meeting, the most important milestone in the completion of the Type Certification activities, was successfully held at the EASA headquarters in Cologne on the last week of September. The meeting provided further evidence of the outstanding cooperation between EASA and AgustaWestland that has enlivened the qualification programme since the very beginning, and involved all of the specialist from the European Authority and AgustaWestland in multiple working sessions concerning all the disciplines and the certification subjects. As for the foreseen exit criteria of the meeting, a plan toward the Type Certification release was established focused on the accomplishment of the remaining duties. 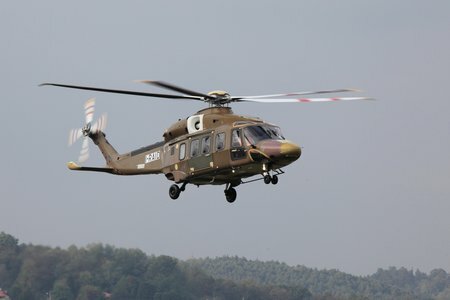 These typically include the final EASA validation activities on board of the first, fully representative production aircraft which is now ready to fly at AgustaWestland Vergiate plant. Two pre-production helicopters have been devoted to the development of offshore and search and rescue configurations and mission kits. This will allow making basic mission kits immediately certified and available to customers once the aircraft are delivered, reducing the time for customers to get crews and aircraft operationally ready. Also, initial support services have just been made available to operators with an AW189 Flight Training Device (FTD) recently qualified by an EASA / ENAC joint team to FTD Level 2 as per CS-FSTD(H), installed in the new simulation building which will also include an AW189 Full Flight FFS. A second AW189 final assembly line is being established at AgustaWestland’s Yeovil facility in the UK, which will initially build the AW189 helicopters that will be used for the UK’s new Search and Rescue service. The AW189 is designed in response to the growing market demand for a versatile, affordable, multirole medium helicopter. The new 8-tonne class, twin engine helicopter is optimised for long range offshore transport and SAR missions and has already received orders for more than 80 units making it the market leader in its class since its launch at Paris Air Show in June 2011. The spacious cabin is configured with 16 seats as standard. Seating options include a high density 18 seat or a long range 12 seat layout. The AW189 is unique in having a 50 minute ‘run-dry’ capable main gear box, exceeding current certification standards and offering unmatched safety and reliability for long range offshore operations. The AW189 is part of the AgustaWestland Family of new generation helicopters that includes the AW139 and AW169 models. These all possess the same high performance flight characteristics and safety features as well as share a common cockpit layout, design philosophy and maintenance concept. This commonality will allow more effective operations for customers operating helicopter fleets across the 4 to 8.5 tonne categories. This entry was posted in News by Editor. Bookmark the permalink.